The Holy Grail for eye surgeons would be to have an implant that would provide for simultaneous far and near vision–and everything between–after cataract surgery. Although multifocal intraocular lenses have been in common use now for over 20 years, they are not for everyone. Specifically, certain conditions such as astigmatism, retinal or corneal disease, and dry eye can make vision after multifocal implants less than optimal. 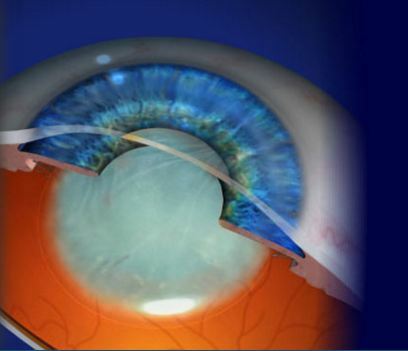 Last year, the Symfony intraocular lens, made by AMO, was approved by the FDA. This is the first so called extended depth of focus lens to enter the marketplace, creating a longer range of clear vision as compared to previous multifocal designs through improved optics which correct not only spherical aberration, but also chromatic aberration. Although Symfony patients might not be able to read the very smallest lines of print after surgery, we are finding that they tend to have a more effective range of vision than traditional multifocal IOl patients. Specifically, we’re finding that Symfony patients tend to excel without glasses in real world situations like seeing the dashboard while driving a car and reading a cell phone, tablet, or computer screen, whereas older designs that had more magnification at near tended not to see well with intermediate tasks. Moreover, the Symfony lens is now available in a toric version that corrects for astigmatism at the same time as it corrects far and near vision. This enables patients who previously were not candidates for multifocal lenses to have an extended range of vision. Is the Symfony lens the Holy Grail for cataract surgery? Well maybe not quite, but it appears to be the closest thing to it we have at our disposal today. The smiles and happy faces I see the day after surgery, with patients asking, “can I have my second eye done tomorrow” appear to be proof that this technology works. So, here’s the deal with this EpiPen fiasco. A lot of people assume this is due solely to corporate greed and capitalism run amok. Well, that’s not the whole story. Mylen is able to raise the price of an EpiPen to unconscionable levels because excess regulation from the FDA and the government has created nearly insurmountable barriers to entry for other generic manufacturers, thus creating an effective monopoly for Mylen, so they can raise the price to whatever they want. This isn’t capitalism, this is rent seeking: effectively, a government sanctioned monopoly. With true capitalism, there would be effective competition, and in a rational world with true competition you would be able to buy an epi-pen for about 20 bucks. As an eye surgeon, I use epinephrine every day in surgery. What does it cost me? Well, today, I was signing invoices for my surgery center and came across this invoice for 75 1 ml vials of epinephrine, for which I paid the princely sum of $1,215. Do the math: that’s $16.20 per cc of epinephrine (in fact, until recently, the cost was MUCH lower, but that’s another story). The branded Epipen that sells for $600 is sold in packs of two syringes, each with 0.3 cc of epinephrine, for a total of 0.6 cc. That 0.6 cc amounts to about $10 worth of product, yet it is sold at a markup sixty times higher! Don’t get me wrong: I’m a capitalist. I want to get rich. But I also want to sleep at night, and I cannot see how we as a society can permit this kind of excess regulation that stifles true competition in medicine and the pharmaceutical industry. My favorite generic manufacturer, Imprimis Pharmaceuticals, may be entering the fray with an affordable, generic epipen soon and I hope this situation will remedied. 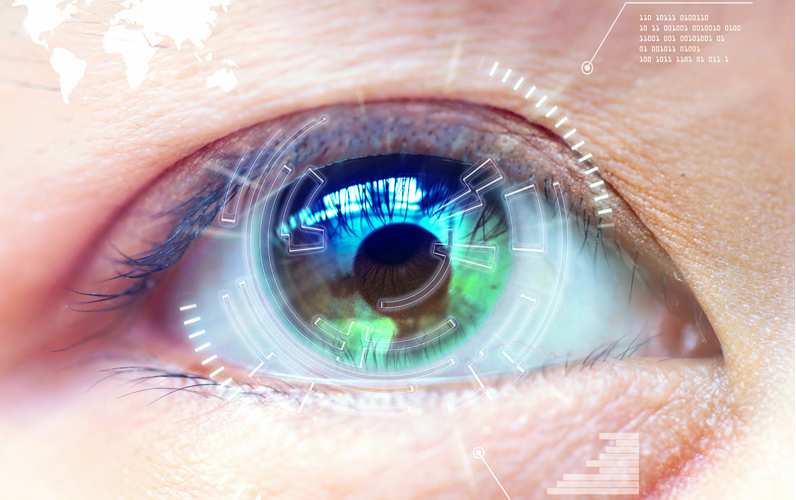 A WaveScan is a computerized device that we use to create a “fingerprint” of your vision prior to having surgery with LASIK or PRK with the AMO/VISX Star S4 IR excimer laser. Although other people may have the same refraction as you, your WaveScan is unique to you. 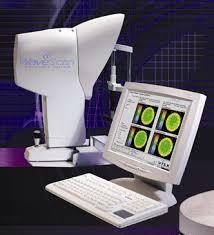 This technology allows us to capture your refraction, including higher order aberrations, and to upload your diagnostic data to the computer that drives the laser. 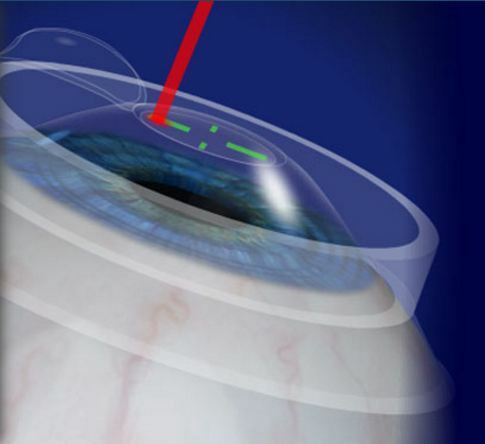 Because the laser has iris recognition technology (called “iris registration” or “IR”), the laser will know the difference between your right and left eye (thus eliminating the possibility of wrong site surgery) and, after locking onto your eye, will deliver a customized treatment in the exact spot where the diagnostic data were acquired. 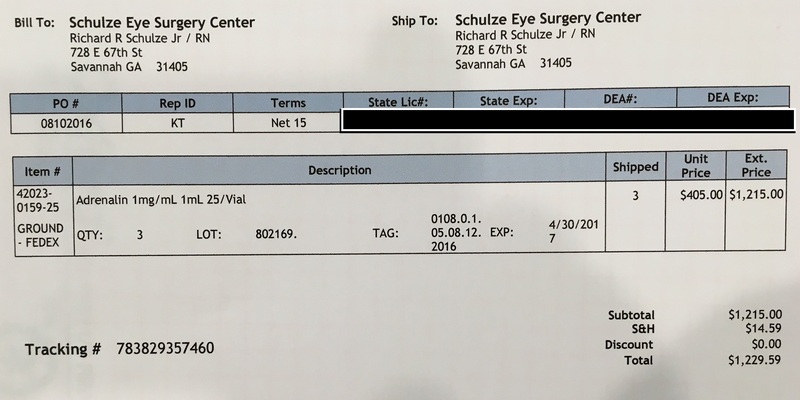 Carrying on our tradition of innovation in eye surgery, the Schulze Surgery Center was the first center in coastal Georgia to offer this technology. Using the WaveScan together with our AMO/VISX Star S4 IR excimer laser allows us to offer truly customized wavefront guided LASIK and PRK, called CustomVue. LASIK is an acronym for “laser assisted in situ keratomileusis.” The procedure uses the excimer laser to reshape the cornea so as to correct your nearsightedness, farsightedness, and astigmatism. With LASIK, the laser reshapes the cornea underneath a corneal flap (think of the flap as being like a trap door on the surface of the cornea) allowing for quicker healing with less pain. In fact, most of our LASIK patients are back to their normal activities the day after surgery. A cataract (from the latin word for “waterfall”) is simply a cloudy lens. You can imagine how a cloudy lens would block light that needs to go through your eye in order to see. What we do with #cataract surgery is quite simple: we take out the cloudy lens and replace it with a clear one. For obvious reasons, you see better through a clear lens than you do through a cloudy one. Here’s where this gets interesting: understand that when we remove the cloudy lens and replace it with a clear one, we can insert any power lens that we want! Because the techniques for measuring the eye prior to surgery have become so sophisticated, we can now plan our surgery so that nearly all of our patients have less dependence on glasses and contacts, and some patients can even eliminate glasses and contacts entirely. Take a look at the cataract section on our website here to learn more, and check back for future posts in this blog as we discuss nuances of cataract surgery. Here’s a little eye surgery trivia for you. 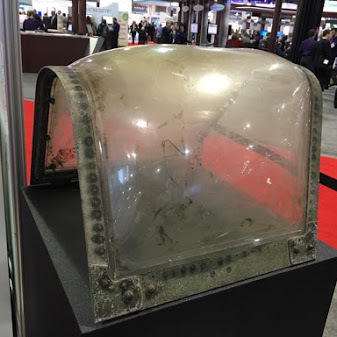 This canopy from a British Spitfire fighter plane gave Sir Harold Ridley the idea for the intraocular lens. A fighter pilot in the Second World War was shot down and a fragment of the canopy entered his eye. Normally, the eye rejects any foreign body with a violent inflammatory immune response. In the case of the fighter pilot, however, the eye remained quiet. Dr Ridley realized he could make clear lenses out of the same material of the canopy and implant these lenses in the eyes of patients who had their natural lens removed with cataract surgery. Thus was born the intraocular lens (IOL) and, thanks to Dr Ridley’s amazing insight, tens of millions of patients who would otherwise be blind have had their vision restored. Sadly, Dr. Ridley was vilified by the medical establishment during most of his career, and it wasn’t until near the end of his life that his contributions were appreciated. This is a question I get fairly often from patients coming to me for refractive surgery. Since the excimer laser was first approved for use in 1996, we now have over 20 years of experience to answer this question. Understand that both LASIK and PRK use the same laser, the excimer laser, to reshape your cornea to improve your vision, whether you have nearsightedness, farsightedness, or astigmatism. The difference is that #LASIK reshapes your cornea underneath a flap (think of the flap as being like a trap door on your cornea) whereas #PRK reshapes your eye on the surface. LASIK offers the advantage of quicker healing. Most patients with LASIK have excellent vision the day after surgery. Disadvantages include a greater incidence of dry eye symptoms and the remote but real risk of a flap complication, including subsequent dislocation of the flap after trauma even years after surgery. PRK takes a little longer to heal, but offers the advantages of simplicity (there’s no LASIK flap to have a complication with) and less incidence of dry eye symptoms. Most PRK patients have useful vision the day after surgery, but may take up to several weeks to achieve their best vision. Interestingly, because military personnel are in harm’s way and thus at risk for eye trauma, the military tends to prefer PRK over LASIK so as to avoid the risk of flap dislocation. Studies show that quality of vision between PRK and LASIK are essentially identical, with some studies giving the nod to PRK. So what is best for you? If you have a thin cornea, a history of dry eye, or abnormal topography, PRK would be your best choice. If there is any question as to suitability for LASIK, we generally prefer PRK because of its greater simplicity. Or, if you’re simply not a LASIK or PRK candidate, the implantable contact (collamer) lens–the ICL http://schulze-eye.com/patient-education/staar-visian-icl-implantable-contact-lens/ –or Refractive Lens Exchange (http://schulze-eye.com/patient-education/refractive-lens-exchange/ ) might be best for you. When you come for your consultation, Dr. Schulze will review your findings and help you make a choice that is best for you. This is a common question I get in my daily practice. Why is it that when we reach the age of about 40, our near vision tends to slip? Why does this happen? Understand that the reason you have excellent vision for both far and near in the early stages of life is because of the elastic properties of the human lens. Being elastic, the lens has the ability to change shape, and hence change focus, for objects both far and near in a seamless fashion through a process called accommodation. You don’t have to think about it; it just happens because of reflexes that are hard wired into your nervous system. As we get older, the lens loses its flexible properties and thus its ability to change shape to focus for far and near. Typically, once the lens loses its elasticity, the eye becomes locked in to a focal point for distance and then you become dependent upon reading glasses and bifocals for near vision. What can we do to treat presbyopia? The simplest solutions include reading glasses and bifocals. Readers have the virtue of being inexpensive, available universally at any drug store for just a few dollars. Start with a lower power (around +1.25 or +1.50) early in life and understand that every few years you will need to increase the power. There is no right or wrong power; whatever works is the one for you. Realize that higher powers will shorten your working distance and bring things closer to you whereas lower powers will lengthen your working distance and push things farther away. Thus you may want different powers for different tasks; e.g., a higher power for reading close up or a lower power for looking at something farther away like a computer screen. Surgical corrections for presbyopia are available, although these are not for everyone. The ones that work best depend upon your particular situation and age, and these include LASIK for monovision and Refractive Lens Exchange utilizing either a Multifocal IOL or monovision strategy. Older surgical strategies on the cornea such as LTK (Laser Thermal Keratoplasty) and CK (Conductive Keratoplasty) ultimately proved to be only temporary in effect and have been abandoned. Some newer corneal strategies have recently been developed but these typically improve near vision at the expense of far vision and have yet to be proven. Finally, there are eyedrops for presbyopia under development but there are not yet FDA approved. Welcome to the newly redesigned www.Schulze-Eye.com! We’ve revamped the site with an eye towards making it more user friendly for both mobile devices like smartphones and tablets as well as our more traditional computer users. 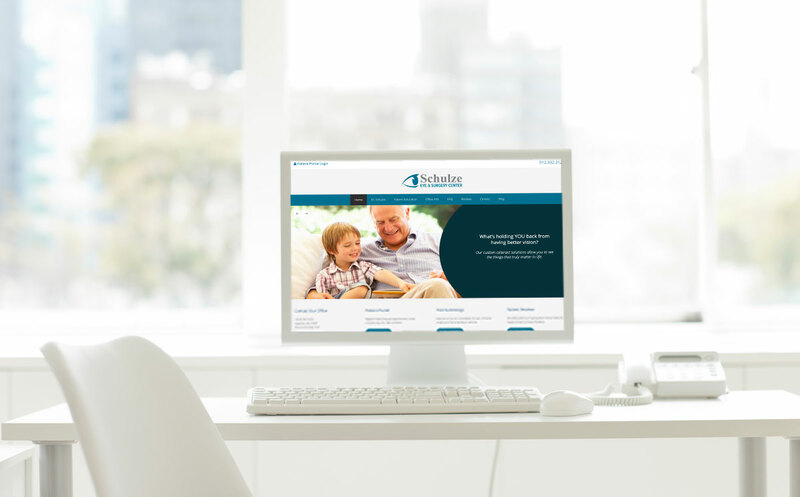 You’ll find tons of useful information, such as reviews and testimonials from our patients, descriptions of the custom cataract solutions we offer, and information regarding the types of refractive surgery we offer, such as LASIK, PRK, and the implantable contact (collamer) lens, the ICL. To keep you informed of all of the latest news regarding eye health and surgery, we’ll be linking this blog with social media like Facebook, Twitter, YouTube, and Google Plus. Please like our content and, if you find it useful, share it with your friends. Richard R. Schulze, Jr., M. Phil. (Oxon), M.D.